had a blast this past weekend being one of the photographers for an event featuring dozens of police department k9 teams demonstrating their training and abilities. 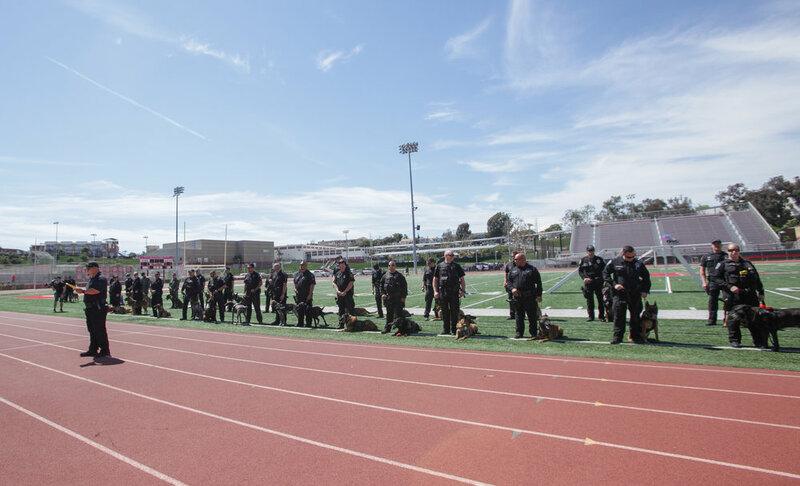 it showcased the skills of human and canine officers alike, and the intense and specialized training they use every day to serve and protect the public. it was especially fun watching the interaction between the individual teams. the dogs and their handlers have a very unique and important bond because of the nature of their work. in many cases their very lives are dependent upon each other. the loyalty and trust was apparent as they moved around the field together. i loved seeing it. the highlight of the day, for me, was the spectacle of a helicopter hovering over the football field and deploying a team of officers, including a k9 ... and by deploying i mean they jumped out of the plane and rapelled down!! that was a extraordinary example of teamwork; the pilot doing his job, the crew doing theirs and the unit, with full tactical gear (and dog) making their way to the target safely. service dogs have a special place in my heart and i am always happiest when i get to be around and photograph them. this was one of those days and i am very grateful for this opportunity. each of us who have pet companions are a team. we depend upon each other for many things. in return for a safe home, a warm bed and good food, our pets give us an unconditional love and a friendship that goes beyond understanding. they guard our hearts and our homes and they fill the spaces of sadness when those times arrive.